Buffalo Sabres GM Darcy Regier announced today the Sabres have signed unrestricted free agent defenseman Christian Ehrhoff to a long-term contract. Buffalo acquired the exclusive rights to negotiate with Ehrhoff from the New York Islanders in a trade on Wednesday night. 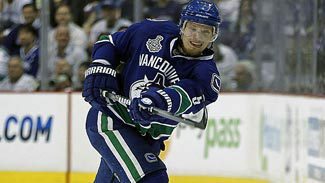 Ehrhoff (7/6/1982, 6’2”, 203 lbs., shoots left) played with Vancouver this season and was seventh among all NHL defensemen in scoring. He posted career highs in points (50) and assists (36) in 79 games, and matched his career best with his second straight 14-goal season. Ehrhoff collected 28 (6+22) of his 50 points on the power play, good for fourth among NHL blueliners. He was also second on the team in blocked shots (108) and time on ice (23:59). Ehrhoff played in all 23 of Vancouver’s Stanley Cup playoff games, and was second only to San Jose’s Dan Boyle in defenseman scoring with 12 points (2+10). In 500 career games with Vancouver and San Jose, Ehrhoff has 226 points (53+173), 338 PIMs and is a plus-74. Ehrhoff, who turns 29 next Wednesday, has only missed 15 games in the past five seasons. He also has 34 points (7+27) in 73 career playoff games. Ehrhoff is a veteran of international play, having represented Germany at the Winter Olympics in 2002, 2006 and 2010. At just 19 years of age, Ehrhoff was the second youngest player in the 2002 Games. A native of Moers, Germany, Ehrhoff was originally drafted in the fourth round (106th overall) by San Jose in the 2001 Entry Draft. After playing five seasons with San Jose, he was traded to Vancouver in August 2009.